Objects join Winterthur's collection for diverse reasons–some because they are exceptional works by talented artisans, others because they humbly inform us about daily life in the past. Table Talk is a multimedia exhibit that explores questions and ideas that spring from one magnificent but unusual table in our collection. Some questions have answers, but others remain mysteries. By looking more closely, we invite you to think about the stories this table can evoke about craftsmanship, collecting, and life in Philadelphia in the early 1800s. 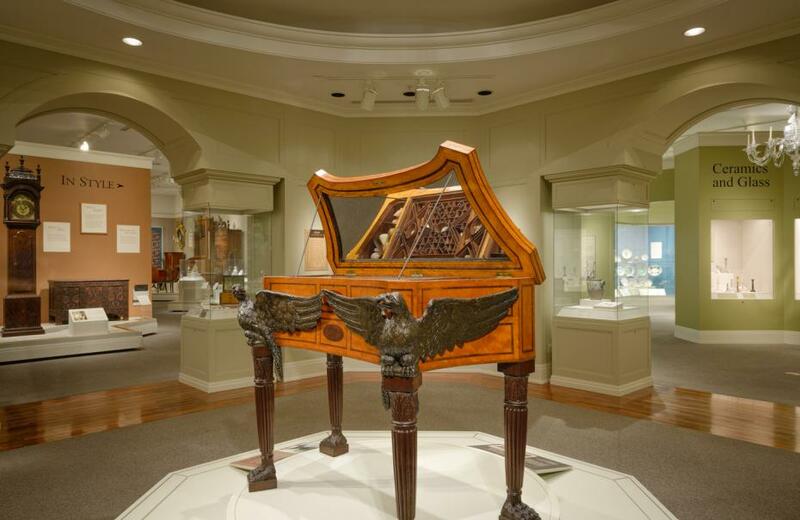 The In Style gallery offers an overview of the major design styles popular in America between 1640 and 1860. Here, visitors can see how specific objects changed in response to fashion over time—how a picture frame became more or less ornate, how chairs became more comfortable, or how textile design responded to fashionable imagery. Each period vignette contains similar objects, but the varying lines, colors, and ornamentation illustrate particular fashionable tastes, creating an excellent visual introduction to American decorative arts. 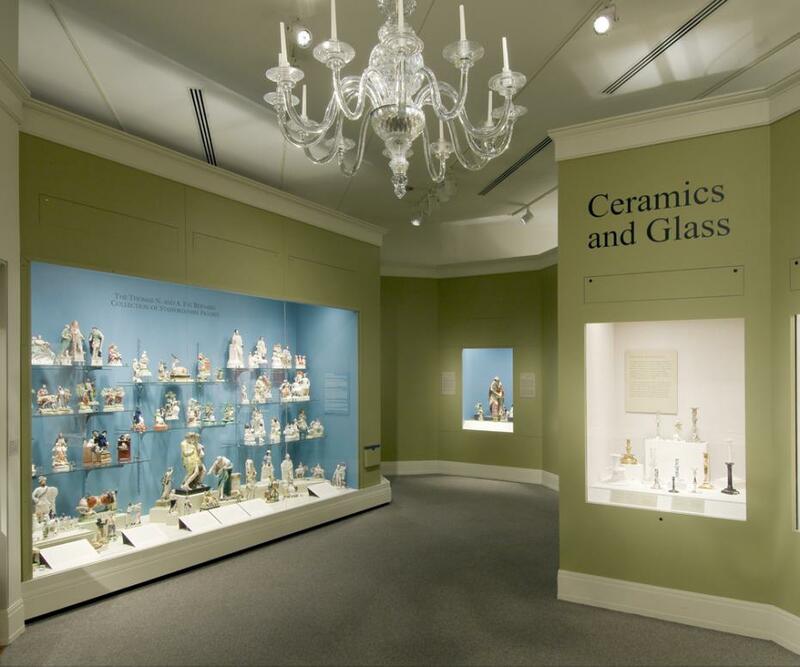 The ceramics and glass gallery showcases remarkable survivors of these fragile art forms from America, Europe, and Asia. 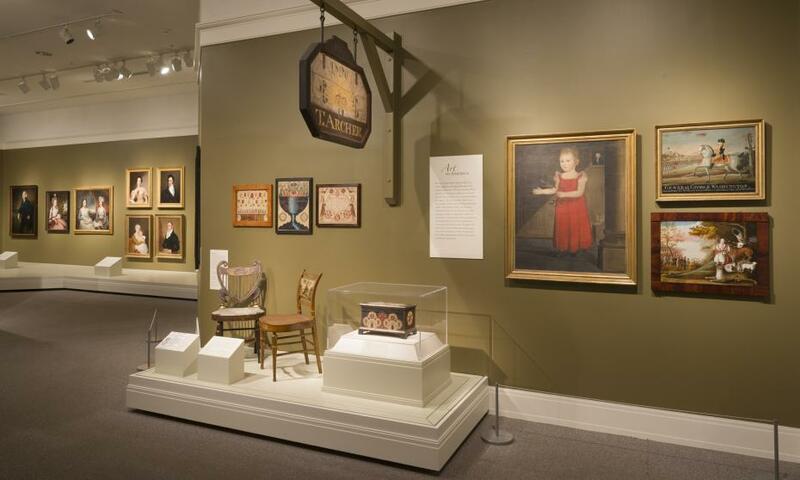 The space is organized to reflect the concept of Winterthur as a “Collection of Collections” and features objects from the 1700s and 1800s. Currently, the spotlight is on an exhibit titled Selections from a Promised Gift: The Daniel and Serga Nadler Collection of Chinese Export Porcelain, which features boldly ornamented 18th- and 19th-century Chinese export porcelain created for American, English, Continental European and other markets. (The Nadler exhibit also is fully available online.) 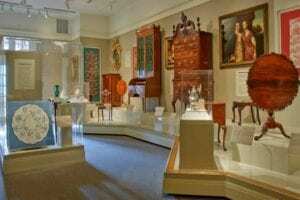 Nearby, visitors can view the Nancy du Pont Reynolds collection of English tin-glazed earthenware (delftware) and, in the next room, selections from the Thomas N. and A. Pat Bernard Collection of Staffordshire Figures. These often humorous objects bring into three dimensions their original owners’ interests in religion, history, politics, literature, antiquity, and everyday life. The Leo and Doris Hodroff Collection at Winterthur presents a donation of more than 200 pieces of Chinese and Japanese export porcelain made for the European and American market between 1550 and 1900. 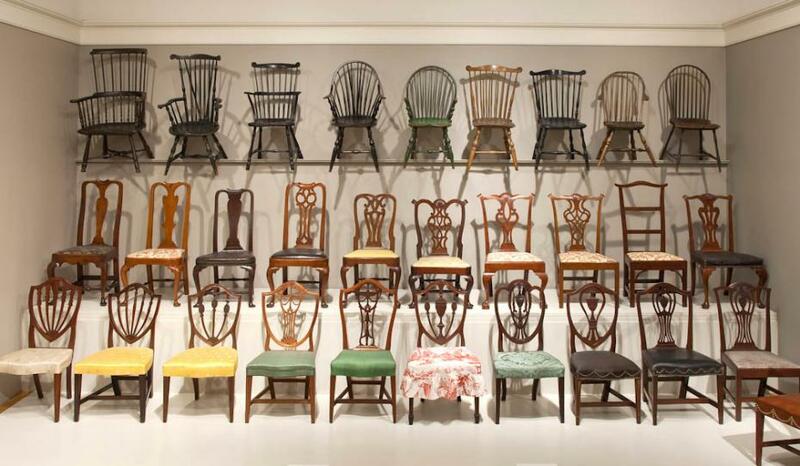 The In Wood gallery offers a variety of ways to explore Winterthur’s world-renowned furniture collection. 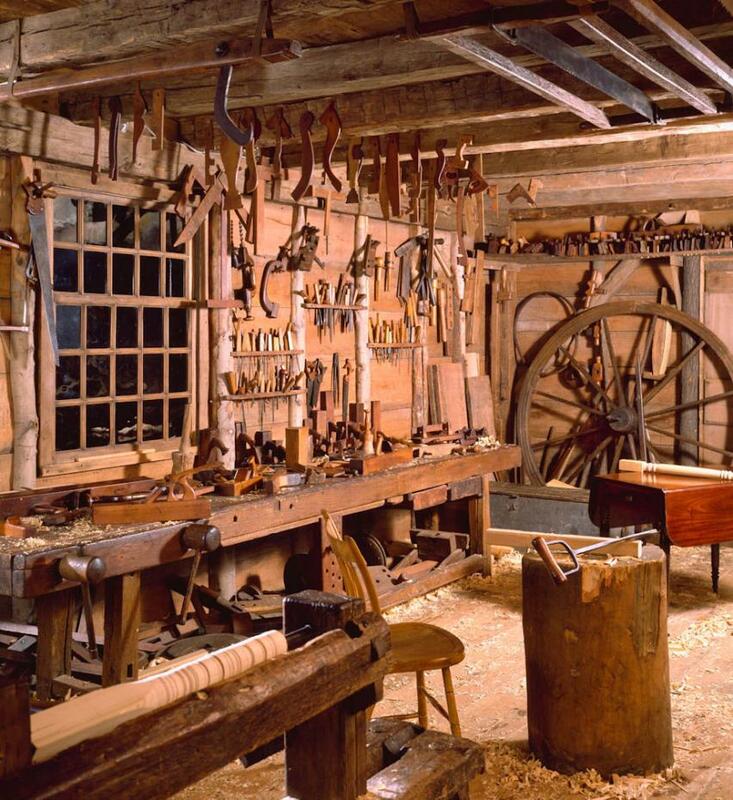 A visual sampling and explanation of various woods used by American craftsmen, along with tools and templates, introduces visitors to the techniques and choices that were part of the cabinetmaking process. 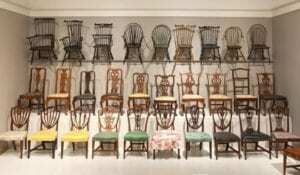 An entire wall of chairs invites visitors to compare chronological and stylistic changes in New England and Mid-Atlantic examples of the 18th and early 19th centuries. Another area focuses on upholstered seating furniture, showing objects with original under-upholstery as well as modern techniques for non-invasive upholstery that allows easy access to the original frames. 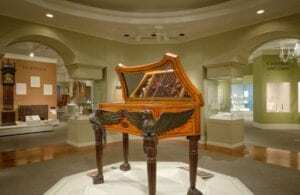 Finally, one section highlights a recent bequest from Arthur Robson of New York City who bequeathed 26 pieces of fine American furniture to Winterthur. 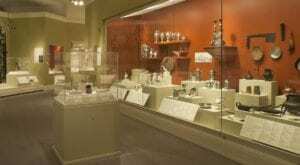 The metalwork gallery displays more than 200 objects made or used in America’s past featuring humble objects prevalent in daily life as well as extraordinary items that would have been familiar to only a small subset of the population. 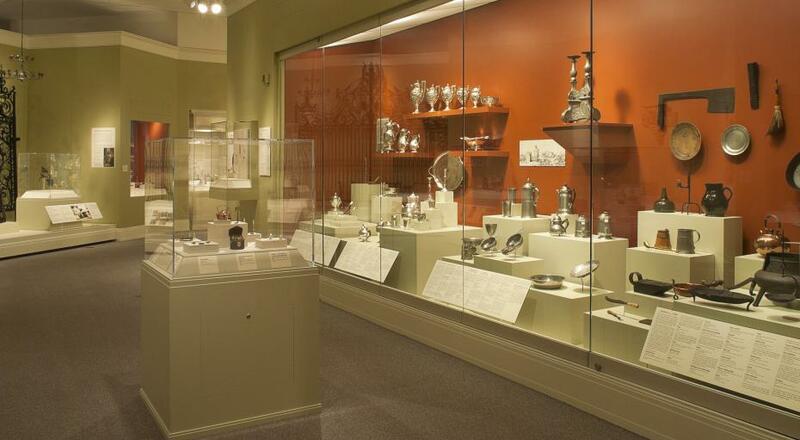 From heavy wrought iron andirons and towering gates to delicate gold jewelry and enameled snuff boxes, these objects drawn from the museum’s permanent collection highlight the essential role of metalwork in workplace and domestic life. Find out more here. Visitors are often surprised to discover the caliber of works on view in this gallery. Important paintings—such as John Singleton Copley's portrait, The Gore Children, and Jerusha Benedict by Ralph Earl—are displayed together with 18th- and 19th-century prints from Winterthur's comprehensive collection. The gallery also highlights the techniques used to create a variety of prints through the display of tools and copper plates. 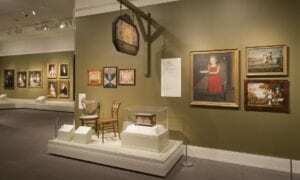 From colorful fraktur (elaborate, decorated documents produced by the Pennsylvania Germans) to the sophisticated portrait paintings of America's favorite sons and daughters, the gallery holds many wonderful surprises. Textiles were one of Henry Francis du Pont's first loves. 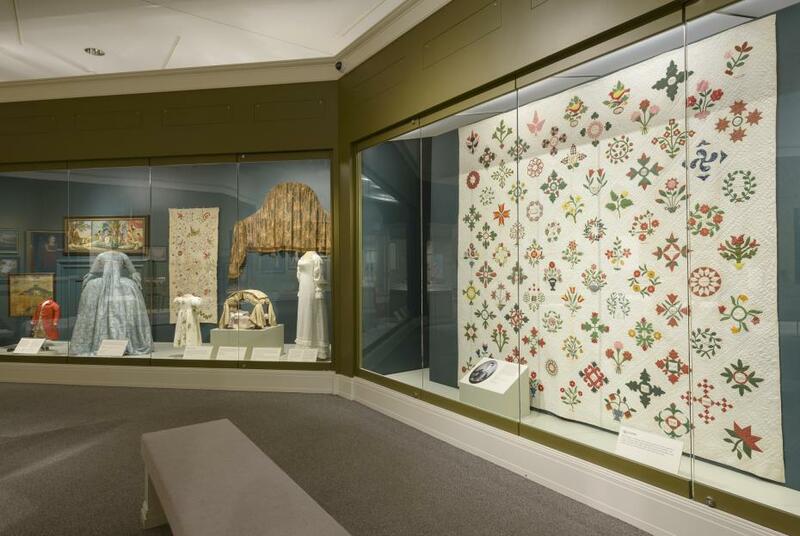 From quilts to gowns, needlework pictures to bedcovers, Winterthur has some of the finest works of textile art made or used in America. 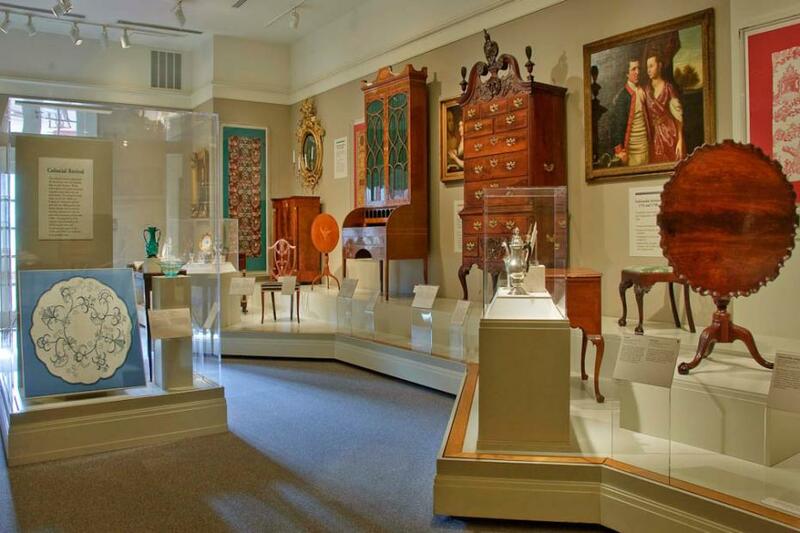 The gallery opens with the "Fashion and Furnishings" display, featuring historic clothing, bed hangings, and slip covers; all were expensive textiles that identified a person's taste, cultural background, and wealth. Displays of quilted, woven, and printed textiles are featured in "Needlework: Plain and Fancy," which highlights selected samplers and other needlework from the collection. Because of the light-sensitive nature of these objects, textile displays change regularly, making repeat visits a must. 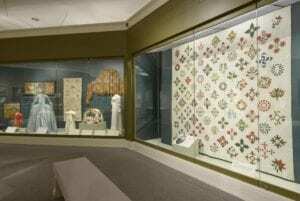 View a portion of Winterthur's quilts collection online or enjoy the virtual catalogue and Web cast of the past exhibition Who’s Your Daddy? Families in Early American Needlework. 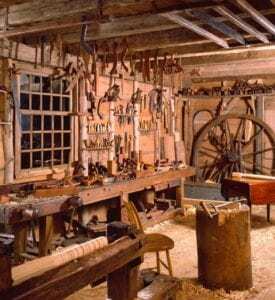 Winterthur’s Dominy Clock Shop and Woodworking Shop are reconstructions of shops used by the Dominy family, four generations of craftsmen who worked in East Hampton, New York, from the mid-1700s to the mid-1800s. Historic photographs and architectural drawings document the working environment of these rural Long Island artists. Objects representative of their work--clocks, chairs, case pieces, looking glasses, and tables--reveal their clientele's taste for conservatively styled, well-crafted household furnishings. Displayed with those objects are the templates, machinery, and more than 800 tools used to produce them. This collection provides a rare opportunity to glimpse a typical working environment of rural craftsmen active two centuries ago. Set in the beautiful glass-walled Dorrance Gallery, the Campbell Collection of Soup Tureens at Winterthur is on permanent display. Produced in elegant metalwork and porcelain as well as earthenware, these sculptural vessels were created from the early 1700s on in Europe, Asia, and North America. These tureens took pride of place on the lavish dining tables of monarchs, nobility, and other wealthy members of society. The fascinating forms range from rabbits to cauliflowers and sailing ships. 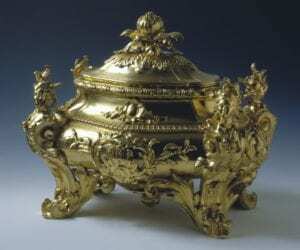 Ornamentation includes brilliant enamel colors, gilding, rococo scrollwork, and classical designs. Enjoy this wonderful group of historically important tureens and other soup-related wares generously donated to Winterthur by the Campbell Museum. Consider the cultures that produced them and learn why the English say, "Of soup and love, the first is best."